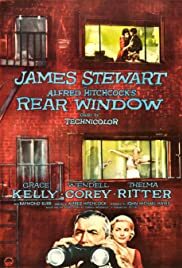 Not only does REAR WINDOW (RW) have Alfred Hitchcock's trademark wit, suspense, and romance (with a touch of friction) in spades, but it's one of his most well-crafted, cleverly-staged movies; in fact, even though RW is based on a Cornell Woolrich story, I can't imagine this story being told as effectively in any medium other than cinema. However, the technical accomplishments (explained most entertainingly in the DVD's documentaries) would be nothing without the engaging characters. James Stewart's neighbors are interesting enough to warrant their own movies, and in addition to providing a wry microcosm of New York City life (the only dated thing about it is the lack of air conditioning), they all reflect possible outcomes for the somewhat stormy romance between laid-up shutterbug Stewart and the luminous Grace Kelly as his upscale fashion maven inamorata. As Brent Spiner said while hosting a showing of RW on TNT, the real perversion of the film is Stewart's reluctance to commit to the irresistible Kelly! In fact, one of the things I like about the movie is the way it shows these two very different people gradually learning to compromise and work together. The piquant final shot shows that a woman can have a happy relationship with a man without submerging her own personality -- refreshing for the 1950s! Great supporting cast, too, including Wendell Corey, Raymond Burr in one of his last bad-guy roles before PERRY MASON, and the scene-stealing Thelma Ritter. Incidentally, the restored special edition RW DVD was put together just in time to include Georgine Darcy ("Miss Torso"), then one of the last surviving cast members. Darcy died earlier this year; she will be missed.